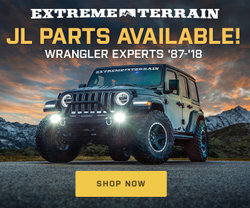 ExtremeTerrain.com is a leader in aftermarket ‘05+ Toyota Tacoma and ’87-2019 JL Jeep Wrangler parts and accessories. Located just outside Philadelphia, PA, ExtremeTerrain provides Wrangler and Tacoma owners with fast shipping and enthusiast-level, award winning service, while also ensuring the conservation and protection of off-road trails. Visit http://www.extremeterrain.com.